I have a (relatively) newly-minted threenager and a (very) newly-minted two-year-old in my house these days. As you can imagine, this stage of life comes with it’s own unique set of challenges. After several days of skipped naps, lots of wailing and crying (sometimes for no apparent reason! 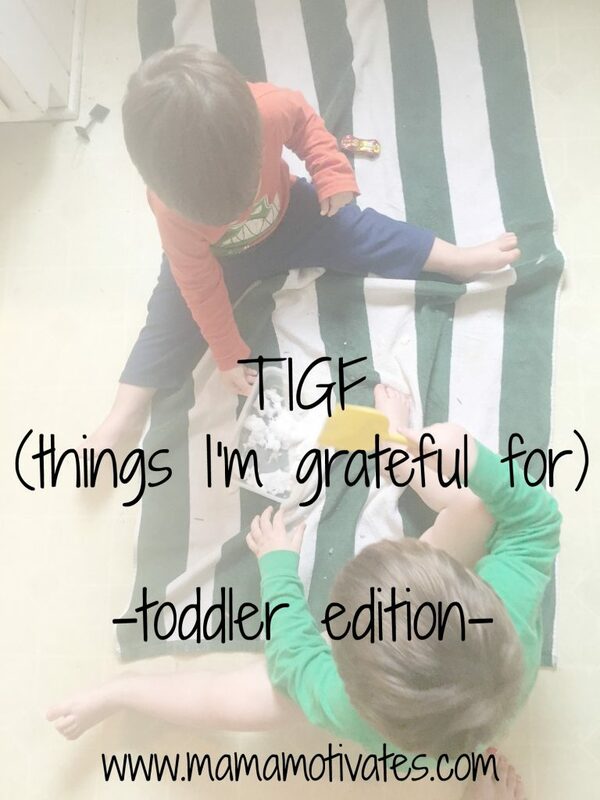 ), and general toddler-ness, I decided for my own sanity, that I’d jot down some of the things I’m grateful for in this season of life. 1) Mama’s kisses are enough to fix any boo boos. 2) The boys are learning the value of taking a few deep breaths to help them calm down when they are upset. 3) The regular questions of “mom, what are you doing?” and requests to sit on my lap are because they just want to be around me. 4) The gallons of milk that are consumed each week in this house are signs that the boys are growing big and strong. 5) The laughter and giggles – sometimes they’re just having good old fashioned fun, other times they are getting in good old fashioned trouble, but man, those two boys love each other. What about you? What are you thankful for in this season of your life?